But for them, it was only the beginning of the Real Story. All their life in this world and their adventures in Narnia had only been the cover and the title page. Now at last they were beginning Chapter One of the Great Story, which no one on earth has read, which goes on forever, and in which every chapter is better than the one before. 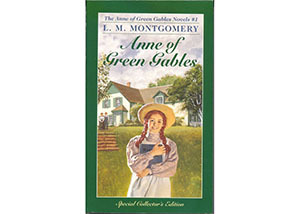 In December of 2009, DeSales University (Allentown, Pennsylvania) put on a wonderful performance of the play “Anne of Green Gables” based on the classic of that name by Lucy Maud Montgomery. From the moment I saw it, I was smitten with the red-haired Anne Shirley, and I couldn’t get enough of her. I purchased the audiobook Anne of Green Gables. From there I moved on to Anne of Avonlea. After that, I listened to Anne of the Island. Next, Chronicles of Avonlea. Then Further Chronicles of Avonlea. Now I know what some of you are thinking: These are children’s books. What’s a priest in his mid-fifties doing listening to the Anne of Green Gables stories? Besides, the books are not only for children, they are for girls! Why is Fr. Ezaki listening to girly books? Clearly, L. M. Montgomery is not writing strictly for children. As her title character grows in age, so does the maturity level of the books. In one of the later volumes, for example, the painful subject of the death of a newborn and its attendant spiritual crisis are handled with great sensitivity. Are the books for girls? Well, Mark Twain liked them, and he’s not terribly bad company. Here are magnificent descriptions that involve, not only our sense of sight, but also our sense of hearing, our sense of smell, and even our sense of touch. Well, after I finished Further Chronicles of Avonlea, I had a dickens of a time locating an audio version of the next book, namely Anne of Windy Poplars. I looked everywhere. It was simply not available commercially. Yet I did find it at last! I reactivated my long-dormant membership in the Philadelphia Free Library for the Blind just so I could get a hold of their audio version of Anne of Windy Poplars! After I had devoured that book, all the sweeter because it was difficult to find, I quickly polished off Anne’s House of Dreams. Next, Anne of Ingleside (also from the Free Library for the Blind). Then Rainbow Valley. Nine books down. Only one more to go: Rilla of Ingleside. I bought this last book on audio. It is in my possession. Yet it’s strange. I’m not in any great hurry to start it. Why? Because when I finish, I will have come to the end of the Anne Shirley stories. There will be no more! The problem with any great series of books—whether it be the Brother Cadfael murder mysteries by Ellis Peters, the Master and Commander sea stories by Patrick O’Brien, or the Anne of Green Gables books by L. M. Montgomery—the problem with any great series of books is that the joy will ultimately come to an end. The adventure will cease. So let us begin right now, through prayer, good works, and the sacraments, to turn the first few pages of that Infinite Book known as the Blessed Trinity. If we persevere, the story will continue in heaven. The adventure will never disappoint us and will never, ever come to an end.